Same Cell Organism is an inspiring collection of queer love stories. In the title story, deep-thinking and angsty Nakagama falls in love with his enthusiastic and open-hearted classmate, Yokota. The two learn in time that despite their differences on the surface, at their cores, they are the same. As they graduate high school and enter the real world together, they pray that they may grow together and that their love can last another day. In another story, Kana and Yuji discover that they share a secret place in their school’s attic. Over time, they build a connection that transcends the rigid boundaries and expectations they are forced to endure every day. In yet another story, Sakaki wishes to be a princess and fall in love with a beautiful man, but the world labels Sakaki as a boy and calls her dreams impossible. Yuki, a mysterious angel boy, leaves heaven to be by Sakaki’s side as her prince and soul mate. These gripping stories have many important things to say about love. Characters deal with realistic fears and issues, wondering whether love can last forever or how to deal with changing relationships as one builds a new family with someone else. But the various couples face these challenges together and give each other hope. They learn that it takes faith to make a relationship last, and that true love is worth the risk of loss. 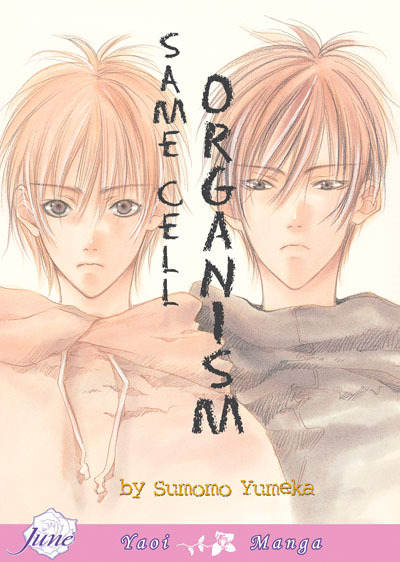 Same Cell Organism is complete in one volume. There is some sexual content shared between characters deeply in love. In my opinion, these scenes are drawn subtly and tastefully, and they add meaning and depth to the stories. I would have felt comfortable reading this manga when I was sixteen years old. Review by Aaron Walsh. 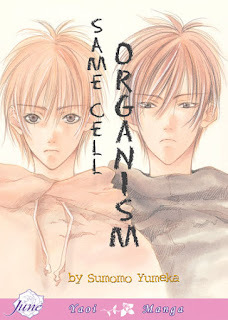 Add your review of "Same Cell Organism" in comments!